University Trustee Stephen Biggar ’92 and his wife, Elisabeth Asaro-Biggar ’92, have made a leadership gift to support athletics and data science, two leading priorities at the University of Rochester. 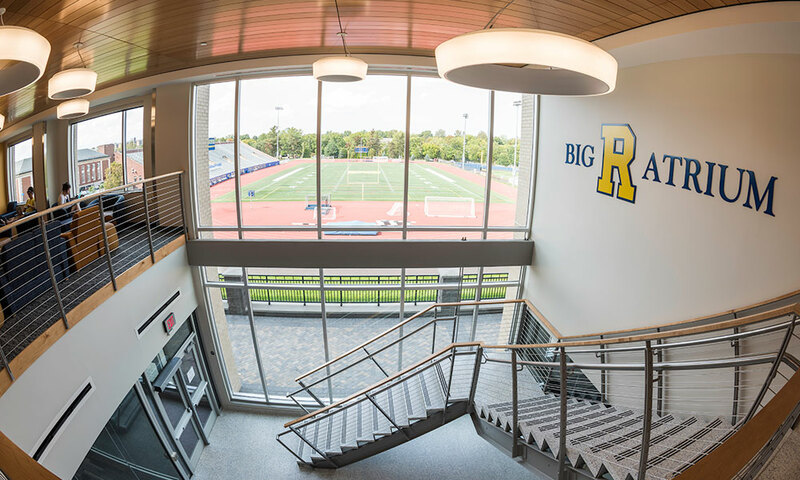 In recognition of their gift, the entryway to Genesee Hall and the Boehning Varsity House will be named the Big “R” Atrium. The Varsity House contains new locker, sports medicine, and equipment rooms, and the atrium serves as a central gathering space as part of this latest addition to the Brian F. Prince Athletic Complex. The projects reflect an ongoing effort to improve the University’s athletic facilities, which began with an extensive renovation of the Robert B. Goergen Athletic Center in 2000. The Biggars’ support also bolsters the University’s robust efforts in data science. Wegmans Hall, an interdisciplinary hub for data science, opened its doors this past spring and houses the Goergen Institute for Data Science, a University-wide center for data science research. The Biggars’ gift helps the University recruit and retain the best talent in the rapidly growing and competitive field by funding fellowships for junior faculty and professorships for senior faculty. In August, Amanda Larracuente, assistant professor of biology, was appointed the Stephen Biggar ’92 and Elizabeth Asaro ’92 Fellow in Data Science, and Ehsan Hoque, assistant professor of computer science, was named the Asaro Biggar Family Fellow in Data Science. The fellowships carry a term of three years and allow the University to honor and encourage outstanding faculty early in their careers. A partner at an investment firm in New York City, Biggar is a University trustee. Asaro-Biggar is a professional musician and will release her debut album this fall. Both are members of the Athletic Campaign Committee and the Friends of Rochester Athletics, and are active volunteers for the University. They reside in New York City with their children. A dedication ceremony for the Big “R” Atrium, Boehning Varsity House, and Genesee Hall will occur on October 12 during Meliora Weekend.